The Audience Builder is used to create dynamic segments of contacts for message sending, searching contacts and filtering analytics reports. Using include and exclude rules and rule sets, you can create dynamic segments of contacts that are updated in real time when performing a search or when a message sends. Real time contact results can be seen in the contact counter at the top of the page when creating or editing audiences. Audiences can be saved and recalled later throughout the platform. Audience trend analytics can be enabled for an audience and then used in Audience Trend Reports for visualizing the population of an audience over time. Audiences are dynamic in nature and audience counts can change over time due to the profile changes of contact attributes, purchases, custom events, etc. If you would like a static audience of contacts that does not change, you should add contacts to a list and build an audience based on list membership. Also note that during message creation, audience counts will automatically exclude invalid contacts, and contacts with a subscribe status of unsubscribed and none. Due to this, you may see different counts of the same audience during message creation compared to searching contacts. Using the audience builder you can search the contacts in your account and display the results in real time. The audience can be saved in the audience rule library and then recalled when creating messages, viewing audience trends or filtering reports. Audience rules can be as simple as "match an email address" or as complex as, "all females with a gmail address that purchased red shoes on a mobile device within the past 7 days". Belong to the "newsletter" list. Have opened a message in the last 30 days. Have not clicked a link in the last 30 days. Navigate to Contacts › Search Contacts and click the Add Rule button to open up the list of available rules. Choose the Lists button to add the list rule. Select the option for Matches any and type the name of the list in the list field. Add a new rule for Behavioral - opens and select the options for Have opened any message within the past 30 days. Add a new rule for Behavioral - clicks and select the options for Have not clicked any message within the past 30 days. If you have contacts that match this audience, you will see the contact count update in real time. Once you have created an audience using audience rules, you can save the audience. Note: When you save an audience, any changes made will not affect automations, drafts or scheduled messages where this rule was previously applied. Click the menu labeled Actions and then Save Audience Rules. 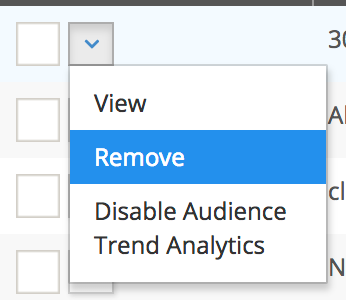 Give the audience a name, an optional description and choose whether to enable Audience Trend Analytics. Note: You can save a maximum of 100 audience rules with audience trend analytics enabled. You are also able to edit an audience rule and save or save as another audience rule. Recall a previously saved audience rule by navigating to Contacts > Audience Rules. 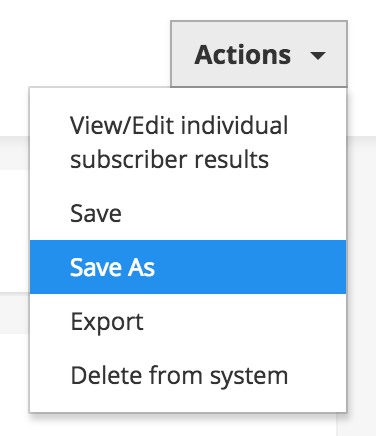 Click on the desired audience, make any edits and choose Save or Save As from the Actions menu. Create a new message or edit a message draft. 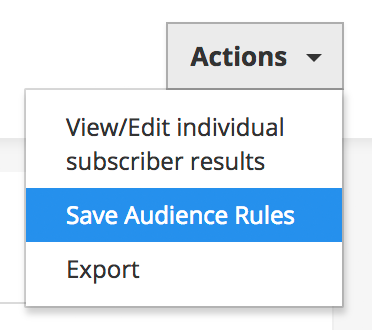 On the Edit Message page, click the Load Audience Rules Button, and choose a saved audience rule. Navigate to Analytics > Event Data Reports. 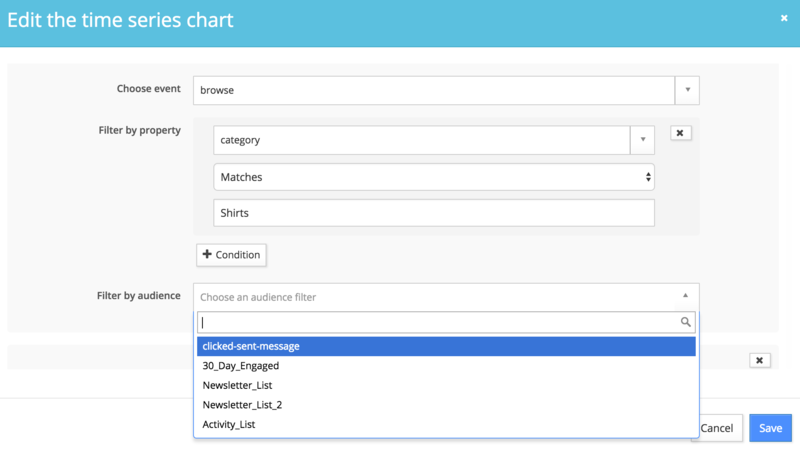 Choose to filter by audience rule and select the audience in the dropdown. Navigate to Analytics > Event Dashboards and create or edit a chart. 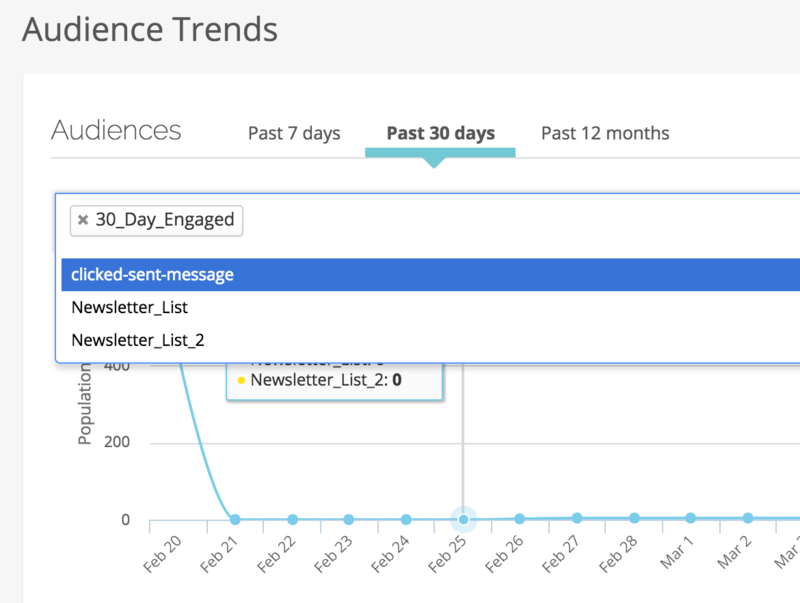 Use saved audience rules to generate an audience trend report. Note that audience trend analytics must be enabled on the audience before it can be used in an audience trend report. Navigate to Analytics > Audience Trends. Click within the open text field and choose the desired audiences to be included in the report. Hover over the arrow next to the desired rule and select Remove. You can also select multiple audiences and use the action bar at the top to remove all selected audiences. Note: When you remove an audience, only the rules will be deleted. The contacts within that audience will not be deleted. Also note that when an audience is removed, it will not affect automations, drafts or scheduled messages where this rule was previously applied. Before an audience can be included in an audience trend report, audience trend analytics must be enabled. 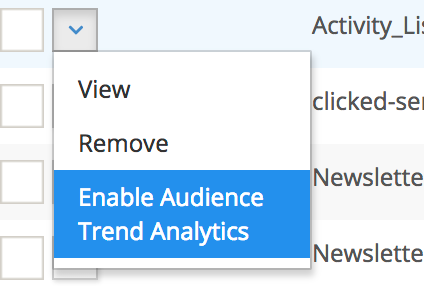 Hover over the arrow and choose Enable Audience Trend Analytics.